Size: Bust 34", Waist 28", Hip up to 40"
This garment pattern was taken from Harper’s Bazar, March 1879. This pattern was originally for a single size and printed on a sheet which had many overlapping pattern pieces which had to be transferred by following different dotted lines in order to decode the pieces needed for garments. This pattern has been painstakingly transcribed from the original overlapping pattern into individual pattern pieces in order to make the pattern easier to use. The original period pattern this was taken from had no indication of size and contained no notches, no grain lines, no button markings, and no seam or hem allowance. This pattern follows the original period pattern lines in order to retain authenticity. As such, this pattern has NO SEAMS OR HEMS ALLOWED. The grain lines included are estimated as a jumping o point for creating your mock up, as none were originall supplied. No yardage information or cutting layouts are included, as they were not included with the original period pattern. No finishing details were included, so you may choose to reference period sewing books for authentic period finishing techniques. Many period sewing books are available for free on the internet from Google Books and similar sources. Several mock ups will most likely be required for this pattern, so make it first from inexpensive fabrics. 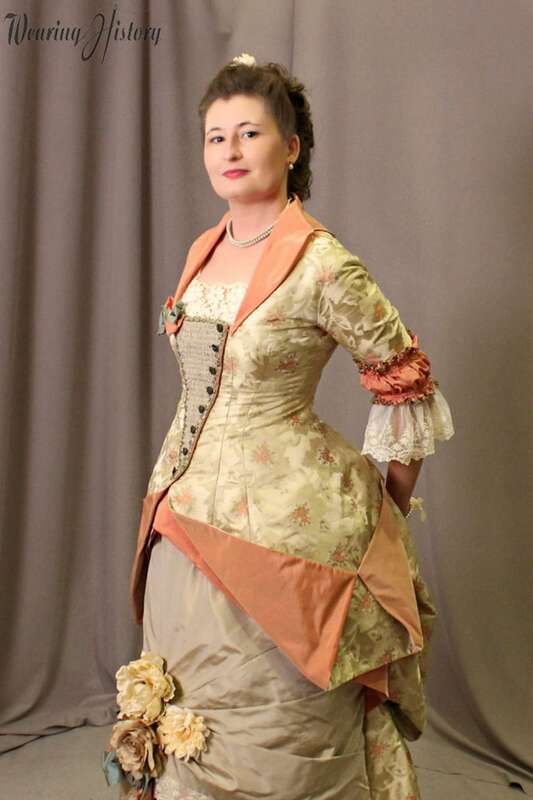 THIS PATTERN IS MEANT TO BE WORN OVER PERIOD FOUNDATIONS, INCLUDING A CORSET & PETTICOATS. American Duchess has done a review of this e-pattern on her blog. You can read it here. -A clean, computer drawn pattern of the basic pattern shapes needed to create the garment illustrated. All pieces originally included in the 1879 period pattern for this bodice, made crisp and easier to use than an original pattern. 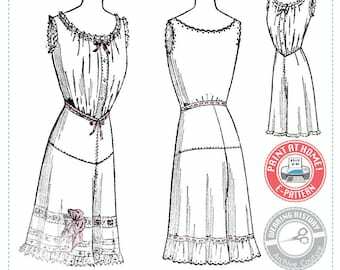 The sleeve pieces are supplemented from another pattern in this same issue, as originally instructed, and will need to be shortened to look like the illustration. Dressmakers of the era were instructed to do the same in the original period instructions. -Original written paragraph of pattern instructions. -Written tips of making a mock up and very basic hints on fitting. -A single size pattern, in the original size of the period pattern. -3 PDF Files to download and print on your home printer. One instructions for printing e-pattern, one instruction pack, one pattern file. As per the "About This Pattern" paragraph above, what is not included is standard of patterns of this age. -NO SEAM OR HEM ALLOWANCE- The sewer may add them at their preferred seam allowance width. -DOES NOT INCLUDE pieces to make the trimmings, lining, turned back accents, or modesty panel. 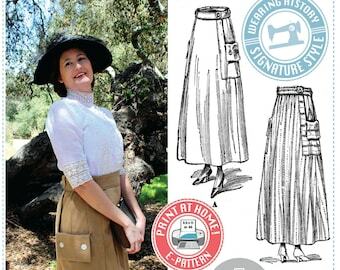 The dressmaker will need to supplement these by using the pieces included and the original pattern illustration for a guide, as our Victorian sisters would have done. -Printing Format: Both USA 8.5" x 11" and A4 paper. -Amount of Paper Required: 29 pages total are required. -Includes 25 pages for pattern sheet, 3 for instructions and cover, 1 for "how to use" sheet. -The download will be done through my website. You will recieve a unique link to your download. -The download link will expire after one week OR two downloads, whichever occurs first. This pattern is formatted for USA Letter Size or A4 size paper. You will need to print this pattern to 100% scale. Open the "READ-ME-FIRST" File for instructions on printing and piecing your pattern. This pattern is tiled into letter sized paper. You will print these documents on your home printer, cut, and tape them together, to form a larger pattern layout. Then you cut and use your pattern just as you would a normal home sewing pattern. This pattern file is formatted to fit on both A4 and 8.5" x 11" sizes of paper, and there will be varying thicknesses of white border, which will be cut off, according to pattern instructions. I can't wait to make this. It's so cute!